Being able to turn a plain, white tent into a beautiful reception area is not a simple task. However, since you are quite literally given a blank slate, the creative possibilities are endless and often result in an elegant and unique look. Many couples in the Grey Bruce area choose to host an outdoor wedding and hold the party afterwards outside as well. Since Grey Bruce is such a rural part of Ontario and a popular place to host farm weddings, it is nice for guests to be able to enjoy the scenery and fresh air as the day’s events occur. When the weather cooperates and the air is warm on a summer’s night, tent receptions can provide a very charming and romantic atmosphere for a bride and groom’s big day. I always make sure to get shots of the reception’s décor when the lighting is still soft and natural. The bouquets and table decorations always look best when it is bright and natural light is shining through the sheer walls. I loved the style of this particular dining area, with its tall centrepieces and hanging crystal chandeliers. 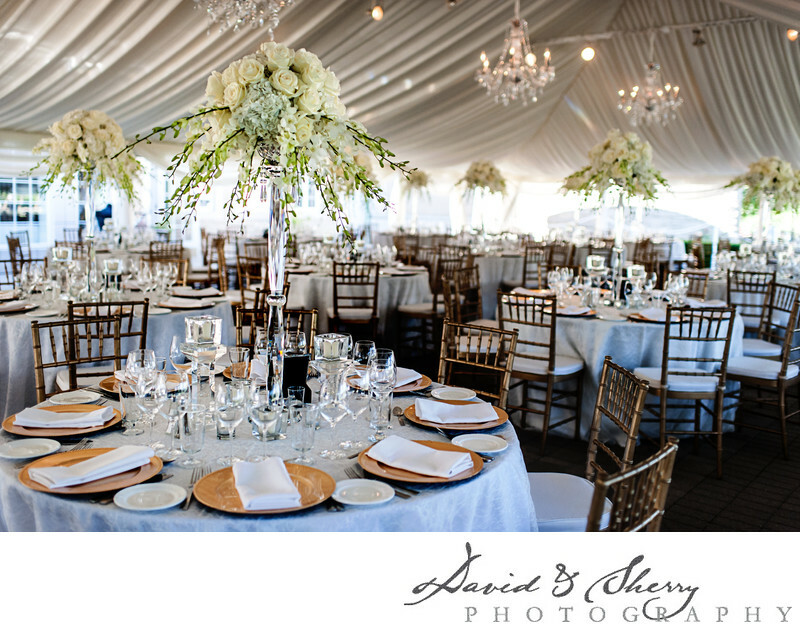 The wooden chairs and rustic place settings compliment the ivory surroundings very well. Although the décor is simple, it completely changed the tent’s primary, normal look into an exquisite area for guests to enjoy the evening.